Being able to chat to a friend about the ups-and-downs of running your small businesses can sometimes make all the difference to getting through the week with your sanity intact. You’re out there on our own so sharing the success, moaning about the difficulties and working out the parts you don’t have first-hand knowledge in, can be both helpful and reassuring. But, when it comes to dealing with your small business taxes, it doesn’t always pay to listen to friends and colleagues who may be willing to share their apparently expert knowledge in this area. You may have a friend who is similarly “self-employed” but if your friend is also a director of a limited company then you need to be aware that the rules on what you can and cannot claim for tax purposes may differ depending on whether you have set up a business as a sole trader or limited company. For example, as a sole trader the rules for claiming the mileage rate on business journeys are more restrictive than the rules surrounding mileage claims made by a director of a limited company. If you make a trading loss in your first few years as a sole trader you have more scope to get tax relief on this loss than if you were trading as a limited company. Even if you have been talking to another sole trader and comparing notes on what each of you claim, the same type of expense may be allowable for one sole trader and not for the other. Whether the expense is allowable or not will boil down to the nature of what they do in their business. Take for example, the yoga instructor who purchases yoga clothing from Lulu Lemon to wear during classes versus the tree surgeon who purchases toe-capped steel boots and a helmet to wear on site. It is likely that the yoga instructor’s clothing would be treated as disallowable expenditure as it is, or could be, part of an “everyday wardrobe”. The tree surgeon’s boots and helmet would be treated as an allowable expense. You can find more detail here. When it comes to travel and subsistence tax expense claims, as a sole trader you may be travelling the same journey as your friend, but the pattern and frequency of the travel may differ and this will affect whether or not your expense is allowable for tax purposes. If say you lived in Winchester but travelled to Bournemouth each week, the pattern of activity is “regular and predictable” and this may affect any tax claim for food and travel expenses on such journeys. Take the sole trader who worked in the same type of business but whose catchment area for client work was Winchester but who travelled to Bournemouth once a year for a training course. Travel and subsistence expenditure in this scenario could be an allowable tax expense. There’s more detail here. Income tax is calculated by assessing income from other sources as well as income from your sole trade business. Individual circumstances can differ which means tax treatment for one taxpayer may not be comparable for another taxpayer. This is particularly relevant when it comes to claiming capital allowances on any assets you own in the business. 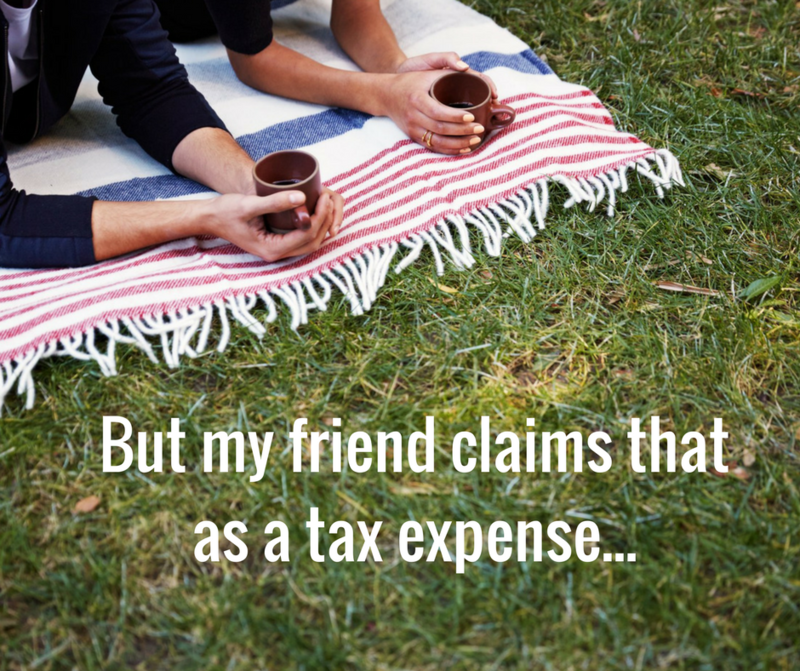 Your friend may well have been preparing their own tax return and filing it online with HMRC. They naively assume that if they don’t hear back within a few months that everything has been approved and the tax treatment that they have adopted for certain expenses has been accepted by HMRC. HMRC do in fact have 6 years to enquire into a tax return if the case involves a loss of Income Tax or Capital Gains Tax “brought above by careless error” and this could even extend to 20 years where the loss of tax is brought about by “deliberate error”. You can read more here. It may also be the case, where your friend has used an accountant to prepare and submit their tax return that the accountant has correctly treated the disallowable expense on the tax return but not brought this to the client’s attention. The client therefore remains in blissful ignorance over which expenses have been claimed as “tax allowable” and which expenses have not. Not only is tax law highly complex and full of inconsistencies that may appear unfair and often illogical but tax law itself is constantly changing according to the decisions of the courts. There is often a time delay in HMRC updating it’s guidance following any changes and HMRC’s interpretation of current tax law can also sometimes differ from the decisions made in the courts. A reliance purely on the HMRC guidance offered online to business owners is sometimes not sufficient. HMRC also has a tendency to be highly selective about which cases it does include in it’s guidance. Arriving at a decision over what and how much tax relief (on your business expenses) you can claim requires professional knowledge of tax and case law. If in doubt, always seek out the advice of a qualified accountant (I can help) who can provide professional advice with regards to what you can or cannot claim expense wise, how much you can claim and through careful tax planning can enable you to make tax savings. So when your friend next tells you that they claim for all their lunch expenses whilst working at the coffee shop every Friday don’t take this as confirmation that you can do the same! If you’ve enjoyed this post, please consider liking or sharing this article by using the social media icons below. It would mean so much if you did. And if you’re keen to get ‘more of the same’ tips and inspiration to help you grapple with the tax and accounting parts of your small business, don’t forget to add your name here to get tips just like these in future. Thank you.